H.E. 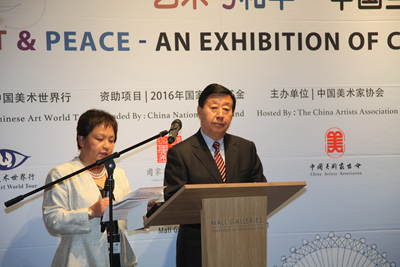 Ambassador Liu Xiaoming Attends the Opening Ceremony of the "Art & Peace - An Exhibition of Contemporary Chinese Art"
On August 14, 2017, Ambassador Liu Xiaoming attended and addressed the opening ceremony of "Art & Peace - An Exhibition of Contemporary Chinese Art" China Arts World Tour in London which was hosted by the China Artists Association at the Mall Gallery. 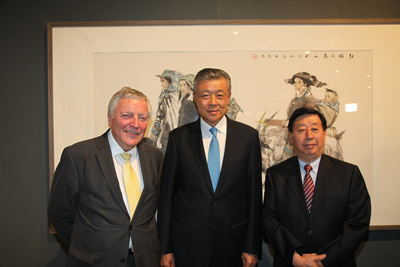 Frances Blois, Honorary Alderman of the City of Westminster, Lord Timothy Clement-Jones CBE, Member of the House of Lords and Deputy Chair of the All Party Parliamentary China Group, and Liu Dawei, Chairman of the China Artists Association addressed the event respectively. More than 200 guests from the culture and art sectors of China and the UK were present. 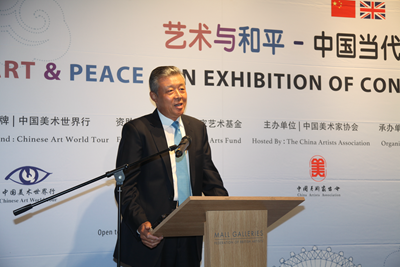 In his speech, Ambassador Liu extended his warm congratulations on the opening of the exhibition and listed three-fold significance of this event: First, the art works represent the Chinese people's keen aspiration for peace. For the Chinese nation, the pursuit of peace, concord, and harmony is a way of life and an unchanged theme for generations of Chinese artists. The various kinds of artistic works showcased extol the life and nature and express the Chinese people's love and pursuit of peace. Second, the event reflects the common wish of humanity for lasting peace in the world. At the world today, peace remains unachieved in many regions, and uncertainties and instabilities are on the rise. Through a rich variety of artistic expressions, this exhibition emphasizing China's commitment to building a community of shared future for mankind is a worthwhile attempt at interpreting the tireless pursuit of humanity for lasting peace in the world. The Ambassador is convinced that viewers visiting this exhibition will gain a deeper understanding about the value of peace, the healing power of art, and the importance for humanity to pursue and uphold peace together. 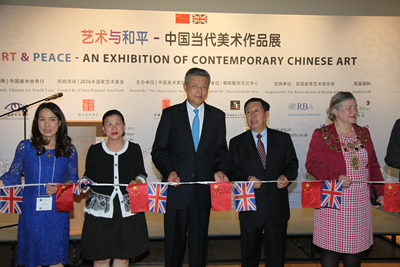 Third, the event adds new highlight to the broad cultural and people-to-people exchanges between China and Britain. This year marks the 45th anniversary of the Ambassadorial diplomatic ties between the two countries, and it is also a year for consolidating the China-UK Golden Era. 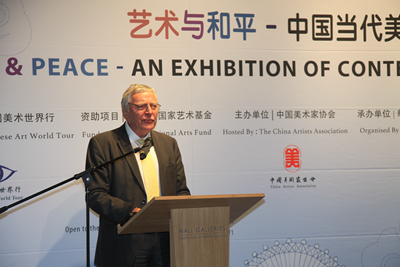 This exhibition and the seminars held by the China Artists Association for academic exchanges will contribute to the overall China-UK cultural ties and people-to-people bond, which will increase the friendship and mutual understanding of the two peoples, and will reinforce the joint efforts to build a world of harmony and a world of lasting peace. 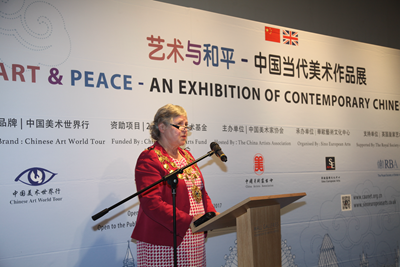 In her speech, Honorary Alderman Frances Blois extended her congratulations on the opening of the "Art & Peace" China Arts World Tour in the UK and her warm welcome to the delegation of the China Artists Association. 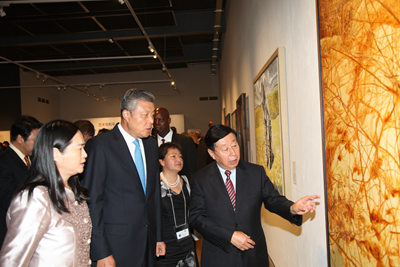 She commended that the exhibition highlighting the masterpieces of Chinese contemporary art is a high-level show. Deputy Chair Lord Clement-Jones said that exchanges and cooperation between the artists and creative sectors from China and the UK are conducive to the mutual trust between the two countries. In the current international situation, this exhibition themed on "Art & Peace" has its special significance. Looking back in history, the Chinese fine art works had been introduced into Europe via the ancient Silk Road. Today, people have witnessed the birth of the new cultural Silk Road. Through this exhibition, the viewers can enjoy the charm of contemporary Chinese art and feel the spirit of innovation of Chinese artists. Chairman Liu Dawei stressed in his speech that the works of this exhibition have recorded the historical moments and depicted the daily lives, natural scenery and national customs with the techniques not only conveying the essence of Chinese ink painting but also the learning from the styles of Western modern art. The exhibition, a microcosm of the contemporary Chinese art, is a manifestation of the concept of "harmony is precious" rooted in Chinese culture, evoking a sense of longing and relentless pursuit for peace and harmony. He expressed the hope that this exhibition would be a bridge of art exchanges between the two countries. "Art & Peace - An Exhibition of Contemporary Chinese Art" China Arts World Tour is an international exchange programme initiated by the China Artists Association in 2016. This event rolling out to Denmark, Belgium, Italy and Finland showcases the highlights of the Beijing International Art Biennale exhibitions and the new works by renowned contemporary artists. The 40 artistic works on display in London include ink paintings, oil paintings, wood block prints, sculptures, watercolor paintings, lacquer paintings and mixed media. In addition to the exhibition, the delegation of the China Artists Association also held discussions with the representatives from the Royal Society of British Artists and the Federation of British Artists, etc.